Does Your Therapist Get it Wrong? You are here: Home / therapy / for therapists & counsellors / Does Your Therapist Get it Wrong? 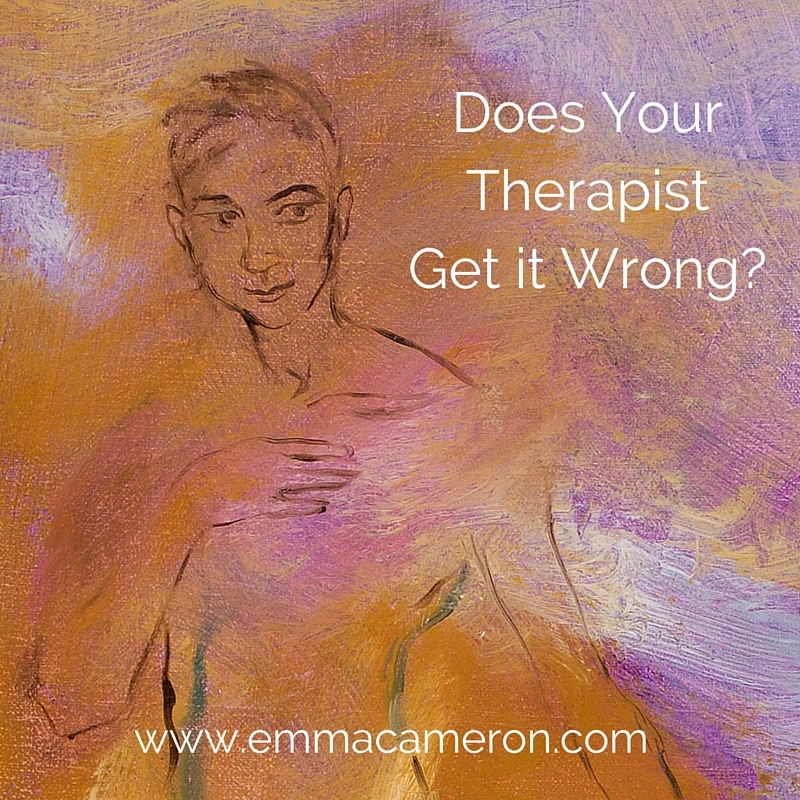 Does your therapist ever get something wrong? Maybe she mis-remembers something you’d told her. Makes a mistake with your session time or your fee. Doesn’t understand something important you are trying to express. Goes on holiday at a time when you really need her around. When these things happen, how do you feel? You really mind, right? If so, stop kicking yourself for minding. I’m here to tell you that this is fine. Not just fine, in fact, but a positively important and necessary part of the healing process of psychotherapy. To get the most benefit and healing from your therapy, it’s necessary to allow yourself to feel vulnerable and have feelings of all kinds when you are in the therapy room. And when you do this, you are allowing your therapist to matter to you. You start to feel attached. Your defences are down, at least partly. This is a major part of how therapy works. And feeling attached like this comes with a scary (or at least, it feels scary at first) side-effect: you can feel vulnerable, exposed, and easily hurt by things that in other circumstances, with other people, might seem trivial and routine. Mentioned my outfit at a time when I wanted to believe she never noticed such superficial things as clothes. Having told me she could reschedule my session to the time I asked for, had to contact me again and said she’d made a mistake and I couldn’t have the session after all. Looked at me in a way that I interpreted as judgemental and unempathic. Mis-remembered a dream I had told her. Looked caring and empathic when I wanted her to go along with my ‘it’s all fine’ defence, instead. Talked about things that embarrassed me and made me cringe and squirm. Asked me questions that felt too probing. Failed to ask me the probing questions that I longed for. Ended the session when my 50 minutes was up. Extended my session by a few minutes because I was in the middle of saying or feeling something important; which made me feel a curious, uncomfortable mixture of anxious, greedy, grateful, loved and overly demanding. Forgot details of a story I’d told her. Mentioned her children at a time when I longed to believe that I was the only person in her life. Was human, fallible and real, instead of perfect! Over-sensitive? Maybe. When we’re in the middle of it, therapy can bring out the most excruciating sensitivities in us. It can bring us to our knees, wondering how we can be so ridiculous as to care about a tiny little thing. It can make us vow: ‘right, that does it, I knew this was a waste of time. I can’t believe I’m upset about that. I must be going crazy! I should stop going to therapy’. Because we are also feeling so hurt and/or angry. ‘How could she do that to me? How could she refer to my partner by the wrong name? She obviously hates me/ never listens to a word I say/ is a useless therapist/ wishes I would leave therapy/ is just like all the other people who’ve let me down’. Or, even worse, we jump into shame and self-blame. ‘It’s because I’m so stupid/ ridiculous/ a failure/ will never get anything right’. And then you might spot something. In your relationship with your therapist, something is happening that is oddly similar to the problems you came into therapy hoping to solve! There’s gold here. Stay with it. Because talking about your problems in therapy may bring some relief, but it probably won’t change things. Enacting something – being in it, in a felt way, such as when you’re feeling hurt or angry towards your therapist – and at the same time, with your therapist’s active participation, being able to slow down, unpick, discuss, resolve, and perhaps forgive the other person and yourself: this can be healing. In psychotherapy-speak, we call it ‘enactment*’ and we also talk about ‘rupture and repair’. There’s a rupture (the therapist gets it wrong in some way, and the client feels hurt, angry, ashamed etc in response to this) and then between them, the client and therapist find a way to repair the rupture. And strangely enough, the rupture-and-repair process is how we grow as people, and part of how we live. I’m talking about outside the therapy room, as well as inside it. Rupture is not bad, in itself. Real life is not (cannot be) about avoiding any ruptures. I suspect that a life in which all ruptures were avoided would be dull and safe and passionless and would feel pretty pointless. But the repair is crucially important. It’s the rupture-without-repair process that can lead to such damage. That can lead a person to feel shameful, hateful, confused, blaming, and with a deep sense of themselves and/or others being ‘not okay’. And sadly, the other people in our lives may not be too good at the repair process. A rupture happens. You (and/or they) feel anxious, or hurt, or angry in response. So then you each do that thing you always do. You slip into your go-to method of coping in a crisis. What do you normally do in a crisis? Bottle it up inside? Explode in hot venomous rage? Dissolve into weeping endless salty tears that feel like they get you nowhere? Run away? Use cold barbed insults, gossip, be passive-aggressive, get a headache, be controlling, become depressed, ridicule the other person, be submissive, try to make them love you? The repair that’s so needed can’t happen. And you feel worse and worse. With your therapist, it can be different. She or he is trained to help you with your experiences of rupture, and live through ruptures with you so that things can be done differently. The small ruptures are actually a great training ground! Here’s where you can really use your therapy to best effect. Because when you are in the middle of a feeling, the brain is in a particularly changeable state. Which means that if you are feeling hurt or angry feelings towards your therapist, because of that thing that they’ve done wrong — this is an incredible opportunity for you to experience something new and different, and healing. So you respond to your therapist’s error in your usual way (running away, or lashing out, or going silent, or whatever your pattern is) — but an amazing thing happens**. She doesn’t shout back, or go silent on you, or run away from you in horror. Instead, she sits and stays centred (or tries to). She may apologise, if she agrees that she got it wrong. Alternatively, she may tell you why she doesn’t agree that she has done something wrong. Or she may have a different reaction. But the really, really important thing is: she doesn’t collapse, and she doesn’t retaliate. She stays connected to you. This is profoundly healing. And it may need to happen time and time again, before it sinks in enough. And gradually over time, instead of running away (or lashing out, or whatever your pattern is) you can try out and practise what happens when you do the unthinkable, the assertive, the straightforward and yet somehow agonisingly almost-impossible thing: of responding in a way that feels like a repair is happening. So talk with your therapist when she gets something wrong. Tell her when you feel misunderstood, hurt, angry, neglected, blaming. Stay with it, and work it out between you. Gradually, over time, you’ll feel fuller inside, more compassionate towards yourself and others, calmer, more confident and resilient. And then you’ll know – the therapy is working. I see clients for Integrative Arts Psychotherapy near Colchester, Essex, and also online via Zoom (which is like Skype). Please email me at espcameron@protonmail.com or leave a phone message on 07515 937027 if you’d like to arrange a consultation, giving your phone number so that I can call you back at a time that’s convenient for us both. ** I’m writing about most psychotherapists here, the ones who are well-trained, well-supported and who know their own process well enough so that they don’t fall into being defensive or attacking (or, if they do, they quickly pull out of it and can talk with you in a connected and empathic way about it). If you have concerns about your therapist, have discussed these concerns with her/him and are left still feeling concerned, you may need to end therapy and/or speak to their professional regulatory body. Very useful articles, comprehensive and well written. Covers all bases I reckon. Emma, this is golden and yes indeed — where the healing happens in the repair. Thank you for this article. I’ll be sharing it. A great post Emma, we have followed you on Twitter! I brought up an issue I was having with counseling, expressed doubts that it was helping, and my counselor terminated treatment with me. After many months of confusion and worsening symptoms, I finally went back. I still don’t feel like I got any closure on that issue of having treatment terminated in such a way. Worse still, I don’t feel like I can bring up any issues with my counselor out of fear that treatment will be terminated again. I’m sorry to hear that, Trixie. It’s so important to feel that these sorts of things can be discussed fully in therapy. I wonder if your counsellor realises how worried you feel about this? Another timely read for me, Emma. I almost wish my therapist had told me about ‘R&R’ (but I guess that’s not the done thing?) as it’s incredibly useful to be aware of. I have problems in life where I feel totally unwelcome – even in my own house. So it was no real surprise when my therapist made an innocent comment about my timeliness and I froze, squirmed, almost completely shut down and became VERY prickly. And I told him he made me feel unwelcome. I challenged him to ask me to leave, to be straight with me. I said I get short-changed in every area of my life and I do not appreciate it here. I accused him of laughing at me for having the AUDACITY to arrive on time and enter the room. I then recalled this in the weeks after the session just so I could feel its sting. I took a break and had some dreams of him waiting for me, patiently. Waiting for me to stand up. Listening. Observing. Wearing very clear glasses. Not minding that I had brought a tiny newborn baby with me (in the dream – I don’t have a baby). Giving me shoes and waterproofs for the rain. I am trusting myself and I trust my therapist enough to allow myself to be angry with him. He looks at me with compassion (which I of course HATE at the time) and reduces me to tears and I feel something being knitted back together. The 50 mins comes up, I stand up, dust myself down, re-tie my hair back, we share a moment of ‘jeezus!’, and I leave it for another week. There is nothing else like it. It’s wonderful to have a truly safe space where this can happen. This is beautiful! Thank you for sharing. And what a wonderful dream. Sometimes dreams can feel like such a gift. I have had an exoerience with my therapist similar to this articles content however i have stopped therapy. My issue has been that he told me to come and see him. (my sessions have been hypno-analysis via Skype) I booked a day off to travel to him for a face to face session. I have suddenly developed Rheumatoid symtoms plus i am feeling anxious again. As he has let me down inn regards to times abd dates before i text to confirm. He never got back to me until 5 mins before i was due to set off. He said he’d returned to London and wouldn’t be there. I was devastated as i had an important weekend coming up. I never heard from him until a week later when he asked my dreams. I text him back and told him how hurt and angry i wad. I tried to say it’s part of the process but i just think he’s unreliable and using that as an excuse. Surely standing clients up is not acceptable behaviour? I am now at a loss at what to do. He claims my dreams were why he did this but won’t help me to understand do I’m ok limbo. He’s offered to continue therapy but how do i trust him now, the rapport is lost. Hi Carrie. It sounds like you and your therapist have been having a hard time really connecting and getting in synch with each other. If you have experience of this type of mis-attunement happening in other relationships in your life, then it’s likely to be well worth working on it in therapy. Getting to a point where you both feel like the connection is good and straightforward is likely to take time, but if you can do that then that will be a really significant part of your healing. Good luck! I have been seeing my therapist for a year. Last week I finally found the courage to ask him a question I’d been longing to ask: ‘Am I OK to be here?’ I then asked him if I could carry on. I confessed that I live in fear of him asking me to leave. He said ‘Of course’ and seemed sincere. I felt better. One week later I arrive. He is a little late and distracted. A plumbing problem, he says. I offer to go, and he says no, and asks how I am. I open up unusually quickly and topics such as my loneliness come up. After 5 mins of me talking, he says my name. ‘I need to go and check on those pipes.’ I realise he hasn’t been listening. He stands up and declares an emergency. He’s been trying to fix the pipes all morning but now is the time he needs to do something. Can we reschedule, he asks. He says my name again, patronisingly: ‘This is an emergency. There is water coming into my building. I cannot let this happen.’ I leave, totally gobsmacked as to how, one week after making myself vulnerable and brave enough to ask him if he will ever ask me to leave, he does just that. He will say it was purely practical and unavoidable. I left my scarf behind once. I also once dropped my car key on the floor. ‘Nothing in therapy happens by accident’, he said. ‘It all means something.’ So, why did he not sort the problem out before I arrived? Why wait until my session? Why invite me to sit and talk before asking me to leave? I was humiliated. I was there for 10 mins and was asked to leave. I now wonder how much of a kick he got out of this. It is sadistic. Possibly abusive. I think he subconsciously engineered for something like this to happen. The power trip he’s on. So unhuman. He doesn’t wear his watch with me – he holds it with both hands. Shaves 3 mins off the start of the session and 5 or 6 at the end. My ‘therapists’ hour’ is 40, 45 mins. I pay for 50. He wants me to go back, of course. To talk about the physical reality as well a the psychic reality of what happened. Why should I hand money to him to bolster this ego trip? He says what this article says – this is where the work needs to be done. But I do not want to return to a room where I do not feel safe with a therapist who is disinterested at best and a sadistic egomaniac at worst. Any thoughts or feelings you wish to share would be very welcome. PS I have emailed another therapist with a view to changing. I fear with no therapy in my life, I will not cope. This incident above has pulled the rug from under my feet. I simply cannot believe it happened. I’m so glad that you and your therapist were able to work through this painful experience of rupture and difficulty. There will be more (many more) times of rupture in the course of your therapy, and the really good news about this is that the rupture-and-repair process is a really big and important part of how the healing work of therapy gradually happens. Sounds like you’re on the right track! Thanks for your thoughts Ana. If one therapist truly isn’t a good fit for you, then it’s fine to look for someone else – there will be a therapist out there who can be a better fit for your needs and temperament. Great article thank you I just wonder….one thing that wasn’t on the list was maybe… learning it’s ok to walk away from some situations and ruptures…sometimes you don’t have to explain yourself or try to make things right….you just have to keep yourself safe. That’s such a great point, Deborah – thank you for making it. Yes, safety is so important and unfortunately it’s true that there are some therapists around who are not able to work with traumatised people safely enough.